Mr. Powell’s article was taken from a Superior Farms newsletter. It’s in the Guide because it makes two important points. 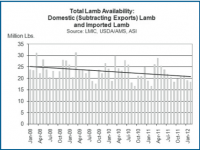 That the very high lamb prices of 2011 were actually counter-productive to the US lamb industry because they reduced lamb demand—which, in turn, resulted in the sharp drop in lamb prices in 2012.